On April 16 of this year, Sr. Clare Crockett, Servant Sister of the Home of the Mother, passed away beneath the rubble caused by a magnitude 7.8 earthquake that devastated Ecuador. News of her death, and the testimony of her life along with it, reached the entire globe and was translated into several languages. Months later, people continue to express their desire to learn more about who Sister Clare was. For this reason EUK Mamie Foundation – HM Television has begun filming a series of interviews in order to produce a documentary film on the life of Sr. Clare so that her story may continue to touch hearts and win them over for the Lord. “All or Nothing: Sister Clare Crockett” will be the title of this documentary film. “All or Nothing” is a sentence that characterizes Sr. Clare and became her life’s motto. “All or Nothing:” If you are going to give God something, you have to give everything. Do not go halfway. You have to make it to holiness. As a promise of what will come to be “All or Nothing,” today HM Television presents this first trailer. It comes to light on a very special day, Sr. Clare’s birthday. 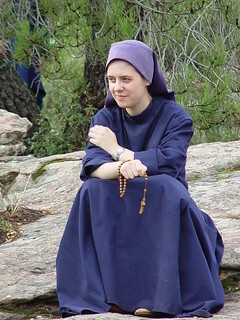 Indeed, Sr. Clare Crockett was born on November 14, 1982 in Derry, Northern Ireland. Endowed with extraordinary gifts for theater and music, at 14 years of age she began to work as television host on various channels. At 18, she received her first minor part in a major “critically acclaimed” film. Yet God burst into her life, drawing her away from her dreams for fame and from the violent environment that surrounded her. Leaving everything behind, she entered the Servant Sisters of the Home of the Mother on August 11, 2001 where she placed all of her gifts and talents at the Lord’s service. A budding actress leaves her career and the open doors to fame behind to give her life to God. Some might see this as a total failure. But was it? Those who knew Sr. Clare speak in this film. After her tragic death in the 2016 earthquake in Ecuador, the failure might be seen as having reached its devastating end. Yet, many think that the story doesn’t end there. Thanks to the Servant Sisters’ archives with over 15 years of photos and videos of Sr. Clare’s life, HM Television presents this documentary to show you the real-life story of this Sister who gave her ALL to God, keeping NOTHING back. We hope that "All or Nothing" can help everyone discover who Sr. Clare really was. We hope that all who see this movie grow in the desire to reach holiness.